Achilles was killed out of his heel. Now, David is at risk of collapsing due to his weak ankles. According to a recent report published in the Journal of Cultural Heritage from the National Research Council in Italy, micro-fractures have been found in the ankle and leg areas at Michelangelo's famous statue. The "David" statue dates from the early 16th century. Initially for more than three centuries, "David" stood outside at the Piazza della Signoria in Florence, exposing to the elements. It was moved inside to the Galleria dell'Accademia in 1873, with a copy placed in the piazza. Research shows that its left leg and the tree stump, where much of its 5.5-ton weight rests, has been weaken over the years due to vibrations caused by the tourists and passing automobile traffic. The quality of the marble used by Michelangelo was also a contributing factor. Recommendations have been made to minimize the risk by retrofitting an earthquake-proof room or moving the statue to a more stable area outside the city. 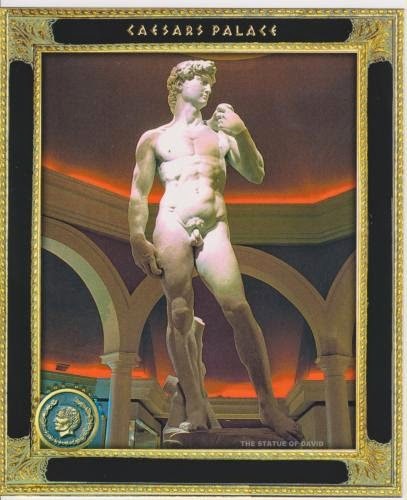 For people in Las Vegas, there is not worry as we have an exact replica of Michelangelo's David as shown on postcard US-1655839 to Germany. It is located at the Appian Way Shops inside Caesars Palace Casino in Las Vegas, made from Carrara marble. He stands 5.17-meter or 17-feet tall and weighs more than nine tons.